Enjoy a stay in this late 1880’s farm house located in a country setting. With three bedrooms and a spacious kitchen you will find the accommodations very comfortable. You can also walk through the apple orchard or pick grapes from the vine. A full breakfast served indoors or out. Just five miles from Punxsutawney, Gobblers Knob, and PA state gamelands. 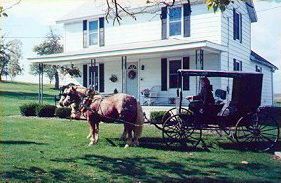 Close to DuBois, Brookville, Indiana, and Pennsylvania Amish Country. Each room has a private bathroom. Single or double occupancy is $75 a night. Payment may be made by cash, credit card, or a personal check (accompanied by a credit card number).